The makings of mixian. All photos by Simone Tong. 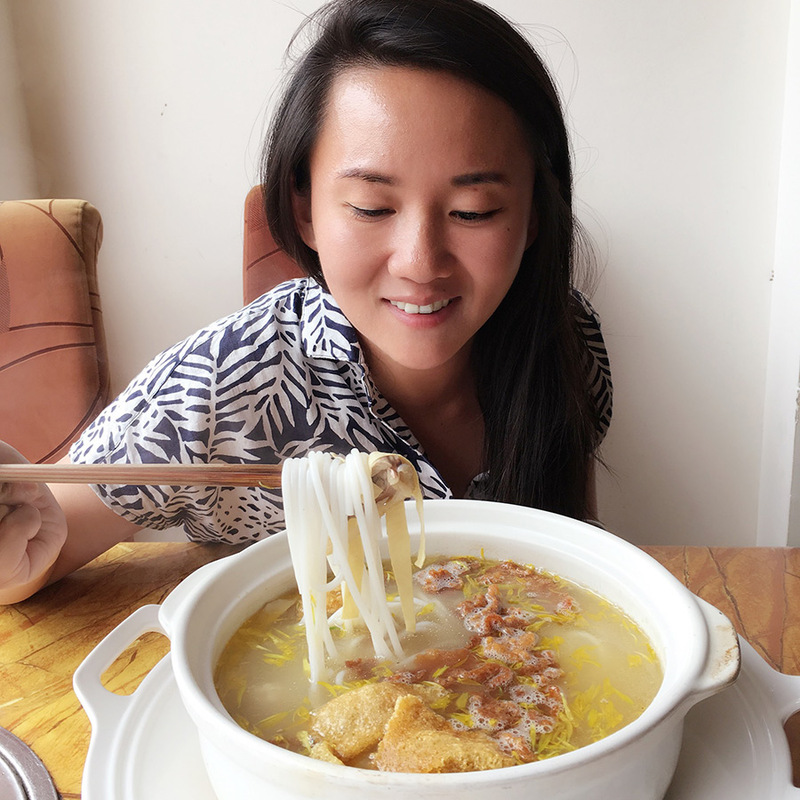 Chef Simone Tong, formerly of the innovative NYC eatery wd~50, just opened Little Tong Noodle Shop in the East Village to introduce us all to mixian, a traditional rice noodle soup from China's Yunnan province. Just what is food from southwestern China like anyway? We'll let Simone do the explaining — she recently came back from a solo trip in the region. 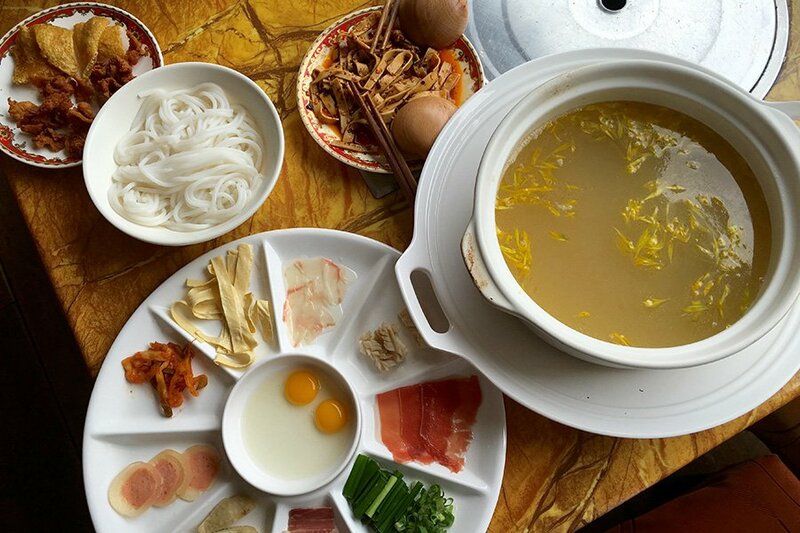 YUNNAN, China – China has a diverse and vast culinary history spanning thousands of years, yet many cuisines from my home country are hardly well known in the Western world. 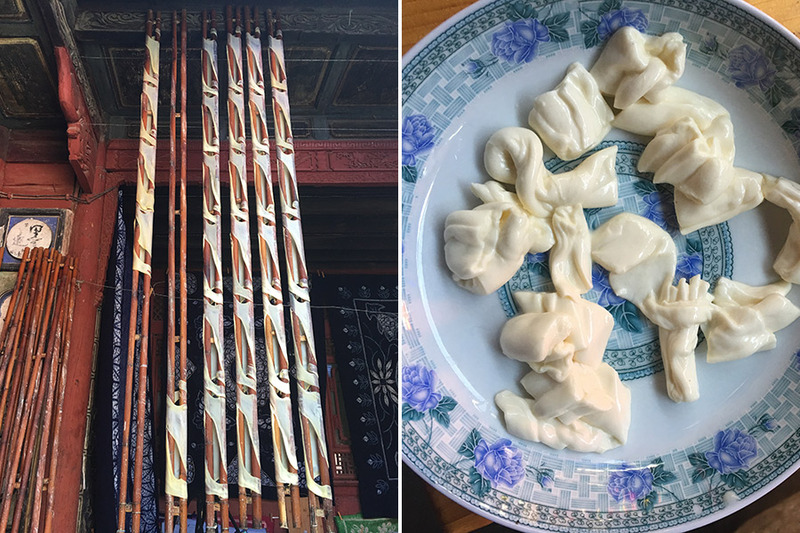 I want more people sharing stories of Chinese food, so I embarked on a three-month solo research trip through Yunnan province before opening my new restaurant, Little Tong Noodle Shop, and sought out chefs, restaurants, and culinary experts who would teach me about the local cuisine. My adventure took me from Beijing to Kunming, the capital of Yunnan, and then to the ancient towns of Lijiang and Dali, where I made friends with four girls from Shanghai and Chengdu, drank tea, hiked Jade Dragon Snow Mountain and Tiger Leaping Gorge, ate spicy-sour hot pot fish, and chatted about being independent women in China. In Shangri-La, on the border of Tibet and Sichuan, home of the majestic Ganden Sumtseling Monastery, my driver invited me to his uncle's Tibetan house party, where we drank qingkejiu, a local highland barley liquor, and danced the night away. 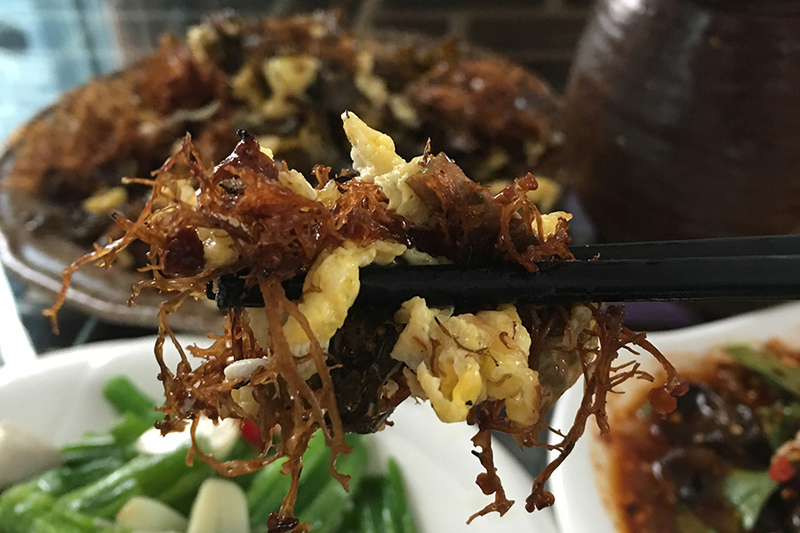 Among my many amazing experiences, here's what I learned about Yunnanese cuisine. 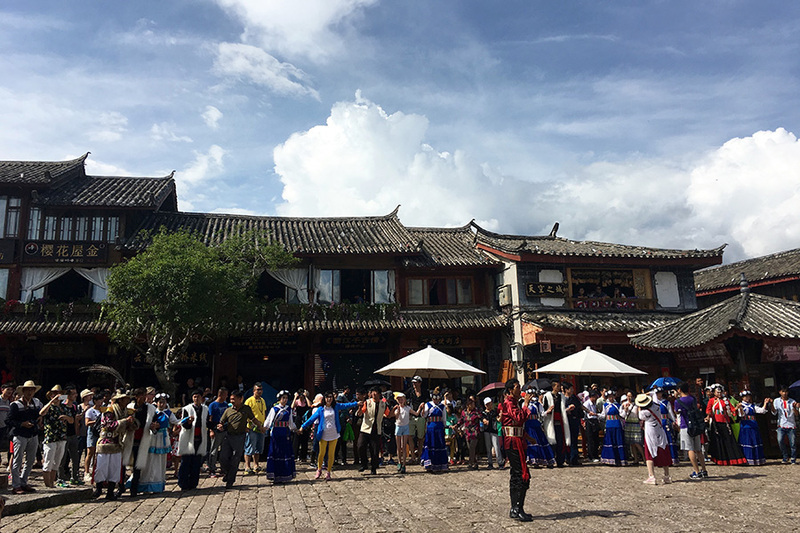 A cultural celebration in Yunnan. Yunnan borders Tibet, Sichuan, Guizhou, Guangxi, Myanmar, Vietnam, and Laos, and is one of China's most culturally diverse provinces, with as many as 26 different ethnic groups, including Han Chinese, sharing the land. It's also one of the country's most biodiverse, with a large variety of plant life and an abundance of wild edible mushrooms. Traveling across Yunnan was like visiting many different micro-countries, each with their own unique delicacies. Time and place is of the essence here, and people eat mostly what surrounds them. Take bugs and insects. Locals like to fry them. 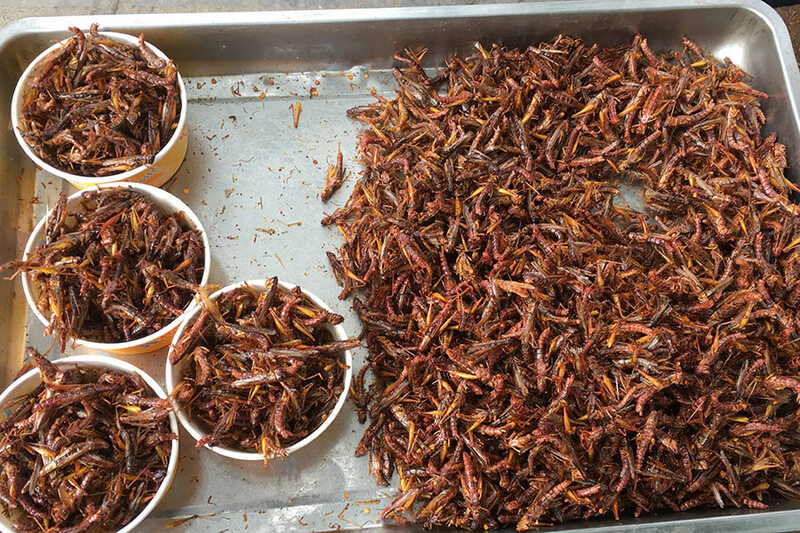 After getting over the initial psychological barrier of putting grasshopper-looking insects in my mouth, they actually tasted quite delicious, like cured egg yolk. Scrambled eggs with moss and tree ferns. Simone eating mixian. Note the yellow flowers. FORAGING IS THE LOCAL M.O. Fresh flowers are another popular ingredient, which I tried in tarts, jams, sake and wine, mixian, and hot pot. I also ate a lot of vegetables, many of which aren't found anywhere outside Yunnan and thus don't have Western names. A few of my favorite combinations were scrambled eggs with moss and tree ferns; roasted garlic and lake weed, a kelp-like vegetable found in Erhai Lake, a giant alpine lake two miles above sea level; and stewed puffer fish with chanterelles, a potentially poisonous dish that, if not prepared properly, can kill people in seconds. The makings of fan cheese. In Dali, folks from the Bai ethnic group love to make rushan, or fan cheese. Fresh cow's milk is made into stringy cheese (basically mozzarella, but the locals didn't know that's what Italians call it), stretched into long, even sheets with long chopsticks, and wrapped around two long bamboo poles. It's then sun-dried, grilled, and seasoned with rose jam. 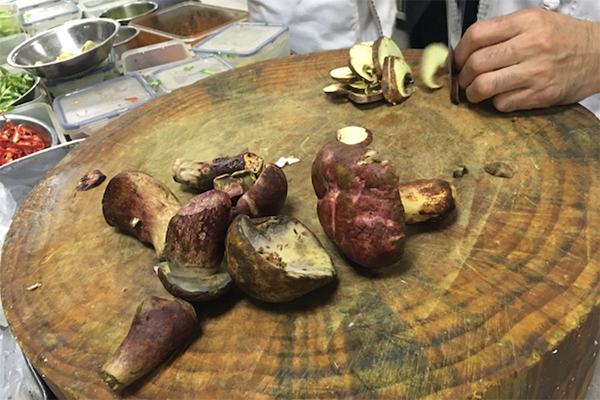 During mushroom season (July and August), Huang Jingkun, executive chef at Colorful Yunnan in Beijing, receives boxes of precious, rare mushrooms foraged by villagers in the forests of Yunnan. One day, he told me he was going to cook a very special mushroom for lunch. It was greenish purple. He had to change the cutting board and knife after prepping the mushrooms because they are extremely poisonous raw and any cross-contamination would cause food poisoning. (Every year in Yunnan, roughly 200 folks are hospitalized and at least 20 die from eating improperly cooked mushrooms.) He sautéed them with beautiful sweet green peppers and generous amount of garlic cloves and butter, and deglazed them with cognac and chicken stock. We ate it with a bowl of Yunnan short grain rice. It was heaven. Simone is the chef and co-owner of Little Tong Noodle Shop in New York City. You can follow her on Instagram at @littletongnyc and @sisitongtong. She travels for the inspiration, the people, and the food they cook.